Abraham Judah Kauvar was born in Denver, Colorado on May 8, 1915, the son of Rabbi Charles Eliezer Hillel Kauvar and Belle Bluestone Kauvar. Rabbi Kauvar was Rabbi at the Beth Hamedrosh Hagadol-Beth Joseph (BMH-BJ) Synagogue from 1902 to 1971, and a member of the University of Denver faculty for many years. 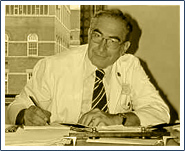 Dr. Abraham Kauvar graduated from the University of Denver in 1935 and received his Doctor of Medicine degree in 1939 from the University of Chicago. Dr. Kauvar did post-doctoral work at the University of Chicago, Harvard University, and the Mayo Clinic. He served with the United States Army Medical Corp for a number of years before returning to Denver. Dr. Kauvar practiced internal medicine and gastroenterology. He was as an outstanding clinician in private practice for 40 years with a dedication to his patients regardless of race, color, creed, age or economic status. Dr. Kauvar was a Professor of Medicine and Associate Dean of the University of Colorado Medical School and also conducted research at the Eleanor Roosevelt Institute for Cancer Research. Dr. Kauvar was recognized for helping to unify the public, private and academic sectors of medicine. In 1965, then-Mayor Thomas Currigan asked Dr. Kauvar to analyze and recommend how to utilize a federal grant for the betterment of health care for the City of Denver. As a result, he was instrumental in creating the Neighborhood Health Program, a prototype for similar programs in the United States. He was recognized nationally by the Robert Wood Johnson Foundation and the University of North Carolina for the Neighborhood Health Program and his subsequent innovations in Emergency Response systems. Dr. Kauvar was the head of the Health and Hospitals agencies in Denver and in New York, head of the Davis Institute for the Care and Study of the Aging, and was the Goodstein Professor of Medicine and Geriatrics at the University of Colorado Health Sciences Center. He was associated with the Rose Medical Center from its inception, served as the seventh President of the medical staff, and founded and headed the gastroenterology division at Rose Hospital. He also served as president of the Denver Medical Society and as a trustee of the Colorado Medical Society. In 1987, Dr. Kauvar created the A. J. Kauvar Foundation, which is dedicated to discovering and helping to fulfill the health care needs of the elderly. Dr. Kauvar received numerous awards for his service to the community. Dr. Kauvar and his wife Jean had four children--Kenneth, Jane, Lawrence, and David.